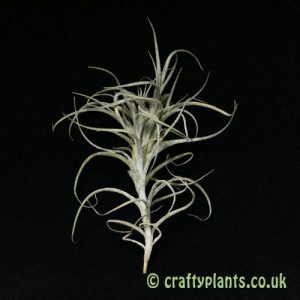 10 individually labelled Tillandsia airplants, specially selected for their forgiving nature. 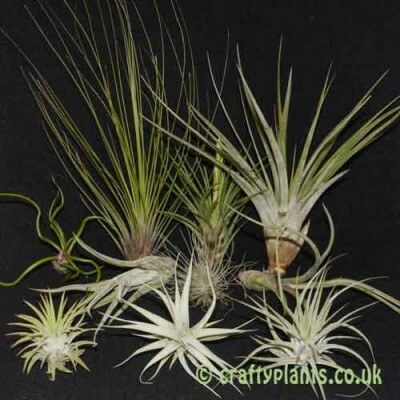 This Tillandsia collection is perfect if your just starting out with airplants. Fantastic plants very happy with the selection , one even in bud. Great selection of plants. Bought as a gift.. One arrived in flower, another devolped a flower stem shortly after arrival. The recipents were very happy- now I want some too!! Great instructions included, easy to understand for beginners. Arrived in a box wisely marked with “Live plants, fragile”, and on time. All 10 plants where there and in excellent Condition, wrapped in tissue in groups of 3 and surrounded by bubble wrap. The parcel includes a care guide which i have found very useful and easy to follow. Healthy looking, lovely plants. I will certainly buy more as this is excellent value for money, especially because you can split the 10 up and give them separately as gifts. 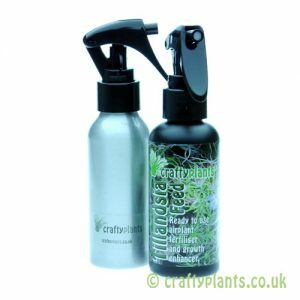 This is a wonderful product, it was very exciting to open the package to discover all the different plants. As said in other reviews, all 10 different plants well wrapped, healthy and labelled. They look fantastic. I’m just hoping that I manage to follow the accompanying care guide properly and keep them all alive! Excellent, I just love these. Arrived in 2 days as stated by Royal Mail. 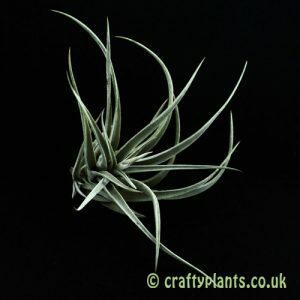 Very nice plants, well packed and in good condition, two of them have flowers coming on them. I hope they’ll be happy in their new home. Highly recommended, excellent value, thank you boys, I’ll be back again! Arrived in perfect condition, individually named, perfectly packed, we were very impressed also each plant a good size. Really hope they settle in their new enviroment. Will definitely be buying more variations in the future. The plants are gorgeous. They were well packed and arrived promptly. I have had so much admiration for them, from friends who have seen them displayed, that I’m putting in a bulk order so I can give some as gifts. I am completely hooked on these delightful additions to my home and my head is constantly filled with ideas of how I can display my next batch – I can hardly wait for their arrival. Bought the 10 plant beginner’s pack and starter accessories as a present. Lovely variety of plants, in good condition, and it appears that 2 are in flower bud. Highly impressed with the qualityof goods and service – I have a feeling that my partner will be ordering some more of these delightful plants. 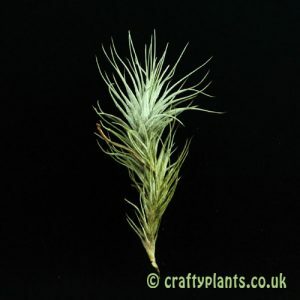 Excellent plants they are all so beautiful and all arrived in PERFECT condition and very well packed, very healthy and two in flower bud, so exciting and fast delivery too 😀 highly recommended. I was recently introduced to Tillandsias when I visited the Botanic Garden Singapore. Ordered a few and some moss and wire. Very happy with products. Products arrived very well packaged. Thanks for providing a great service. Will definitely order from you again. 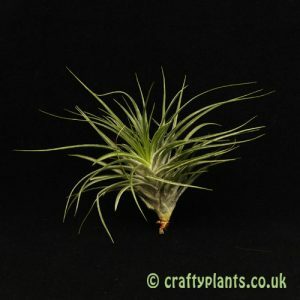 10 beautiful air plants arrived all in excellent condition. Some quite large. I couldn’t be more pleased. My only worry now is keeping them alive. These would make fantastic gifts but I can’t bear to part with my own collection so will have to buy more! My section of 10 arrived v quickly in perfect condition and beautifully packaged. Some were a gift but my husband ‘purloined’ some! I have just ordered a second pack. They are v interesting little plants.